Dhaka, Sep 3 (Just News): BNP Secretary General Mirza Fakhrul Islam Alamgir today said that the government is not eager to arrange the next general election in a free, fair and inclusive manner. “Prime Minister Sheikh Hasina is heading towards establishing a one-party rule in the country. She (PM) has no will to ensure people’s verdict in the election,” Fakhrul said in his reaction on yesterday’s speech by the premier on different issues including upcoming general election. 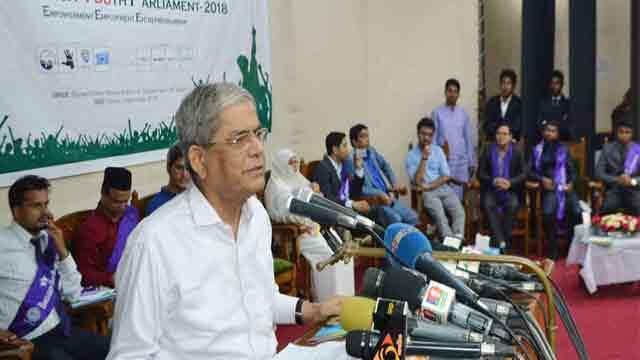 Speaking at a programme held on the Supreme Court premises, Fakhrul said the 11th parliamentary election is knocking on the door while the ruling quarter is continuing arrest of the opposition party men in motivated cases. Claiming that the entire nation has become frustrated hearing the prime minister’s speech, Fakhrul said the country is passing through a critical time over the fate of the upcoming general election to be held at the end of December. The nation expected that the prime minister would give a positive indication for the sake of the country’s people and democracy to ensure equal scope for all political parties in the next general election, but she did not do that, he said. “The prime minister has smashed people’s demand. It is her utter failure and the government must be held responsible for this,” he said. About PM’s refusal of holding talks with BNP, Fakhrul said Awami League did the same in 2012-13 but at last it was forced to hold talks. Earlier at a separate programme, Fakhrul alleged that party’s acting Chairman Tarique Rahman has long been in exile being subjected to the government’s politics of vengeance. “Tarique Rahman has been implicated in the August 21 grenade attack case deliberately. Innocent Tarique Rahman has been subjected to the government’s politics of vengeance,” Fakhrul said. Fakhrul was speaking at a press conference at the party’s central office in Dhaka’s Naya Paltan marking the 11th Jail Release Day of Tarique Rahman, also elder son of BNP Chairperson Khaleda Zia. Fakhrul said the 1/11 government could not implicate Tarique’s name in the case while Awami League-led government has done this in a supplementary charge sheet. Tarique Rahman was arrested during the rule of the army-backed caretaker government on March 7, 2007. He got bail from the court on September 3, 2008 and went to London for treatment purpose and since then he has been living there. “I think, Tarique Rahman is not yet physically fit as he has long been in exile and he can’t return home as he has been implicated in various false cases,” Fakhrul said. Fakhrul alleged that the ruling Awami League is turning the country into a prison with its misrule, and said Khaleda Zia and her son Tarique Rahman have been subjected to extreme political vengeance.